Tin is a soft, silvery-white metal that is very light and easy to melt. Being so soft, tin is rarely used as a pure metal; instead, it is combined with other metals in order to make alloys that possess tin's numerous beneficial properties. These include a low toxicity level and a high resistance to corrosion. Tin is also both malleable (easy to press and shape without breaking) and ductile (able to be stretched without tearing). Tin is most often produced from the mineral cassiterite, which is made up of about 80% tin. Most tin is found in alluvial deposits, riverbeds, and former riverbeds, as a result of erosion of ore bodies containing the metal. China and Indonesia are currently the world's largest producers. Tin is smelted at temperatures of up to 2500°F (1370°C) with carbon to produce low purity tin and CO2 gas. It is then refined to high purity (>99%) tin metal through boiling, liquation, or electrolytic methods. Many everyday items that we associate with tin, such as "tin cans" and "tinfoil," are actually misnomers. Tin cans are, in fact, made from a compound referred to as tinplate, which is steel sheet metal that has been coated with a thin layer of tin. Tinplate efficiently combines the strength of steel with tin's luster, corrosion resistance, and low toxicity. Ninety percent of tinplate is used to make (tin) cans for food and drinks, cosmetics, fuel, oil, paints, and other chemicals. Although tin only makes up a small coating on tinplate, the industry is the largest consumer of tin worldwide. Tinfoil, on the other hand, may have been made from tin for a brief period during the 20th century, but today is exclusively made from aluminum. The use of tin alloys can be dated back many centuries. Bronze artifacts (bronze is an alloy of copper and tin), including hatchets, mirrors, and sickles, have been discovered in locations from present-day Egypt to China. Tin was also alloyed with lead for hundreds of years in order to make pewter kettles, pots, cups, and plates. Cognizant of the negative health effects of lead, pewter today is made from alloying tin, antimony, and cobalt. Tin's more modern application is as a solder for the electronics industry. Used in various purities and alloys (often with lead or indium), tin solders have a low melting point, which makes them suitable for bonding materials. Tin alloys can also be found in a wide variety of other applications, including Babbitt bearings (often alloyed with copper, lead, or antimony), automobile parts (alloyed with iron), dental amalgams (alloyed with silver), and aerospace metals (alloyed with aluminum and titanium). 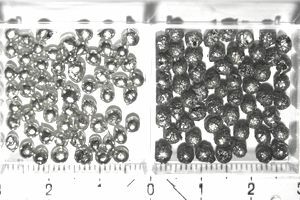 Alloys of zirconium (often referred to as Zircaloys), used in nuclear reactors, also often contain a small amount of tin.